With all of the excitement surrounding Super Street Fighter II Turbo HD Remix and Bionic Commando Rearmed, it's easy to forget that Capcom has other retro resurrections in store for the Xbox Live Arcade and PlayStation Network. 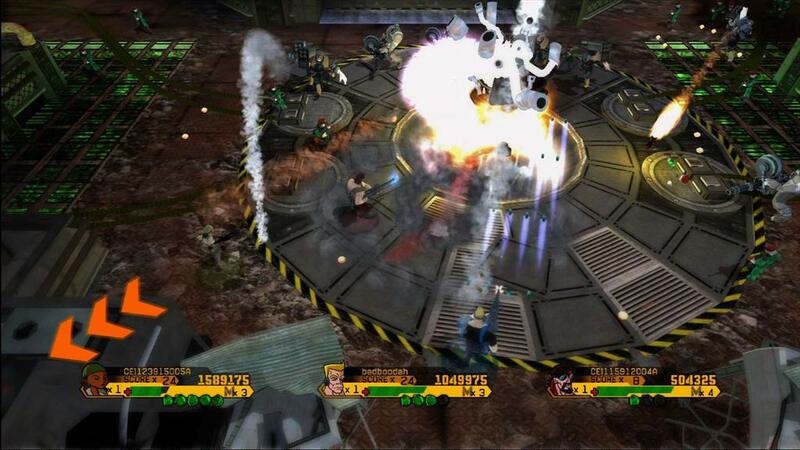 That's right, later on this year the company intends to release their first 194X game in close to a decade, and just last week Capcom released Wolf of the Battlefield: Commando 3, the long-awaited third installment in the Commando/MERCS franchise. Influenced by the ultra-violent action films of the 1980s (Rambo, etc. ), Commando was a vertically scrolling arcade game released in 1985. Outside of influencing an entire generation of overhead shooters (including, but not limited to, Ikari Warriors, Who Dares Win and Rambo: First Blood Part II), Commando also went on to spawn one of my all time favorite arcade games - MERCS. It has taken Capcom eighteen years to bring us a proper third installment to this venerable game franchise, and now that I've had a chance to play through the entire game, I can honestly say that it was worth the long wait. 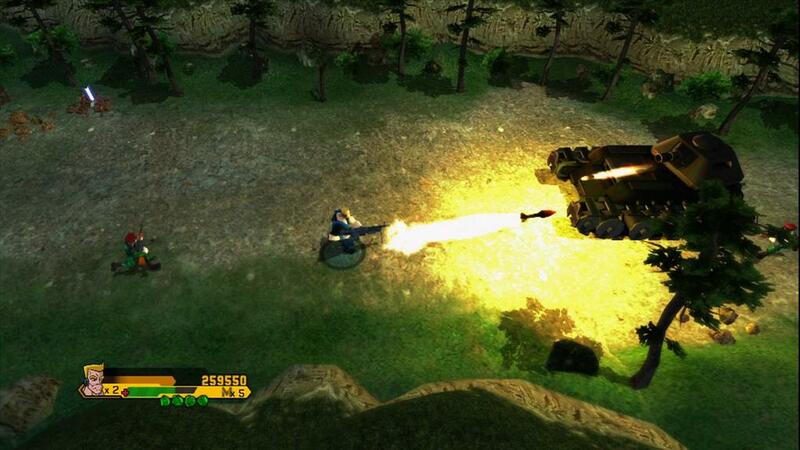 At its core Wolf of the Battlefield: Commando 3 plays a lot like most of the other recent dual-stick shooters (Geometry Wars, Everyday Shooter and even Capcom's own Rocketmen: Axis of Evil). You use the left analog stick to run around the battlefield (dodging bullets, picking up items, advancing the level, etc.) and the right analog stick is used for, you guessed it, shooting all of the enemies that are unlucky enough to get in your way. If you're expecting Commando 3 to be a fully original and innovative action game then you're going to be sorely disappointed. But then again, this is the resurrection of a 23 year old franchise; I can't imagine anybody expects this to be anything more than fan service for all of those gamers who still remember plugging quarter after quarter into the coin-operated cabinet. The story (or what there is of it) is extremely simple; it involves a three-person team of mercenaries making their country proud and the world a little safer by taking down a psychotic dictator who is threatening to destroy the world ... or something like that. Really, the only thing you need to know is that you're an Arnold Schwarzenegger-style action hero and it's up to you to kill thousands of enemy troops, disable tanks and blow up their base of operation. There are a few cinema scenes here and there, but for the most part the story gets out of the way so that the action can take center stage. 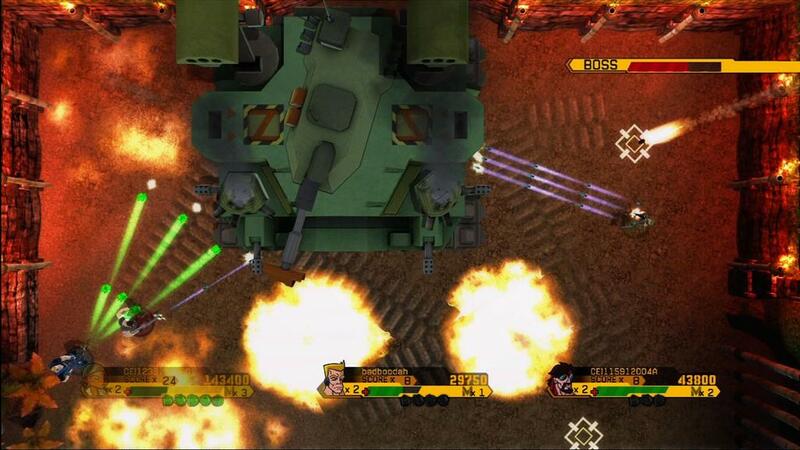 And let me tell you, this is one action-packed arcade shooter. With five levels to go through and plenty of bad guys, Commando 3 has everything you could possibly want in an overhead dual-stick shooter. You have plenty of varied locations (including the forest, a swamp, a secret underground lair, the beach, an ancient temple, and much more), a whole host of nifty weapons to play with (rocket launcher, spread gun, flame thrower, etc.) and even vehicles you can commandeer. 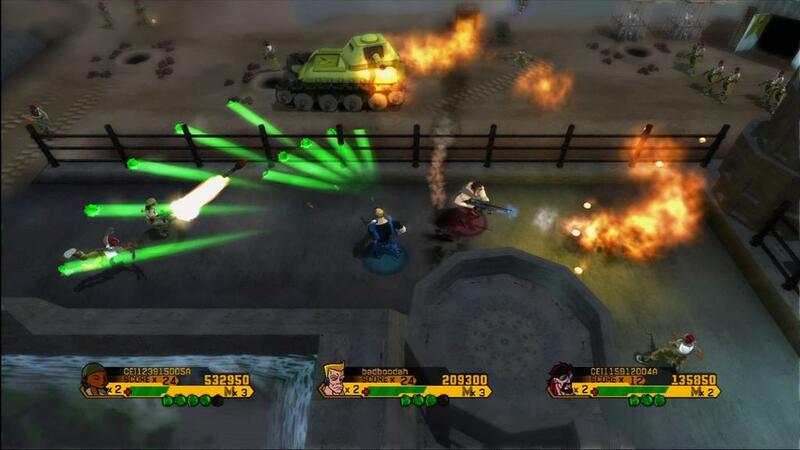 On top of that, each one of the three characters has their own unique M-Crash attack (which destroys just about everything on the screen), as well as extra power-ups that will increase the effectiveness of your weapons. If you've played either of the prequels (Commando or MERCS) then the action will feel right at home, even if this time around you're controlling everything with two analog sticks. Unfortunately Commando 3 does have a few major problems, including one that may just be a deal breaker for some people. The biggest concern is the game's length, which clocks in at around an hour (give or take). Considering the game's price tag ($10) it may seem like you're not getting a whole lot of content for your money. This is a legitimate complaint with the game; it's a shame that Capcom (or, more specifically, Backbone Entertainment) couldn't have added a few more levels. 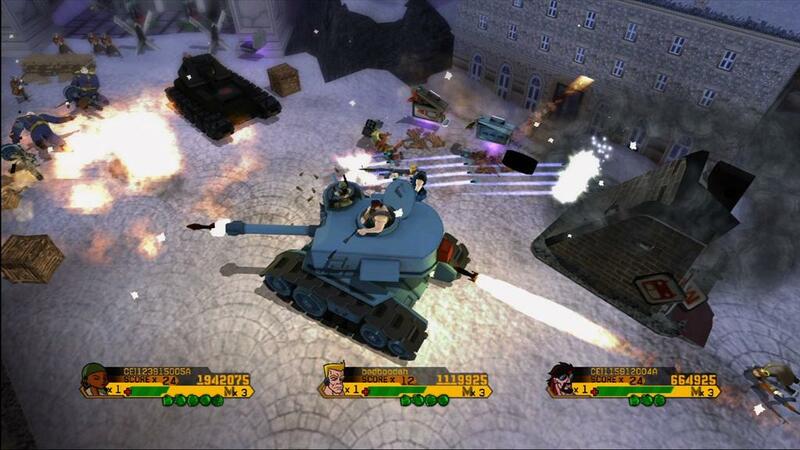 But don't confuse the short story mode with a lack of replay, because this is the kind of game you'll definitely want to go back to time and time again ... especially with your friends.In fact, you can't rightfully talk about Wolf of the Battlefield: Commando 3 without mentioning something about its incredible multiplayer co-op mode. 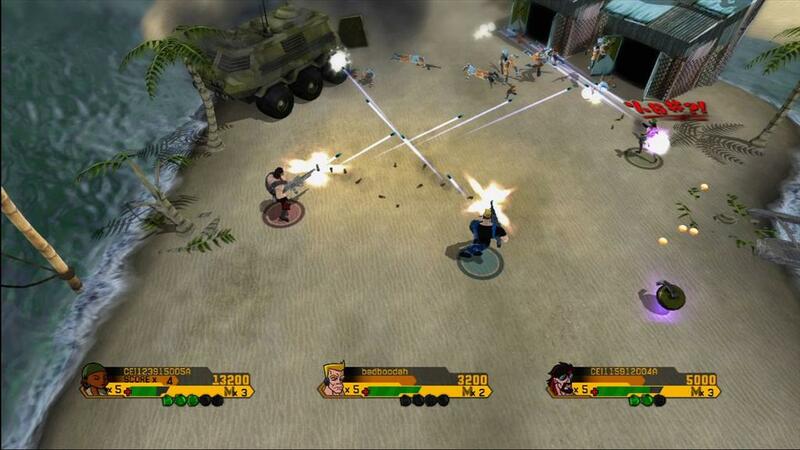 As a single player game Commando 3 is a bit repetitive, but add in two extra players (either online or off) and you have an exciting action game that you'll want to play again and again. It's amazing how different the overall dynamic is between playing it by yourself and with friends, even with a few minor Xbox Live bugs (some of which will hopefully be fixed with title updates) you'll have a blast going through the game over and over again. Sure it's shallow and repetitive, but this is the kind of game the reminds you just how much fun those old arcade shooters were. Like Capcom's other recent dual-stick shooter, Rocketmen, Commando 3 employs an art style that looks like it could have been pulled directly out of a comic book (or at least a Saturday morning cartoon). The characters are exaggerated in almost every way, which fits in perfect with the over-the-top action they're in the middle of. The graphics aren't the best you will see on the Xbox Live Arcade, but they certainly get the job done and look sharper than what we saw in Rocketmen a couple of months ago. Oddly enough, it's the audio that isn't quite up to snuff. Don't get me wrong, the level music isn't bad and the sound effects are passable, but for some strange reason Capcom decided to keep the cinema scenes almost completely silent. None of the characters talk, so all you see is the subtitles of what they are saying. What's more, there's no actual music over most of the cinemas, and the only sounds you ever hear are the occasional (and all too brief) sound effects. It's actually a little off-putting, since we're used to having cinemas be the big showpiece for audio and video. But that's just not the case here. This is the kind of thing that you can easily get over, but it's definitely strange to watch cinemas in complete silence. 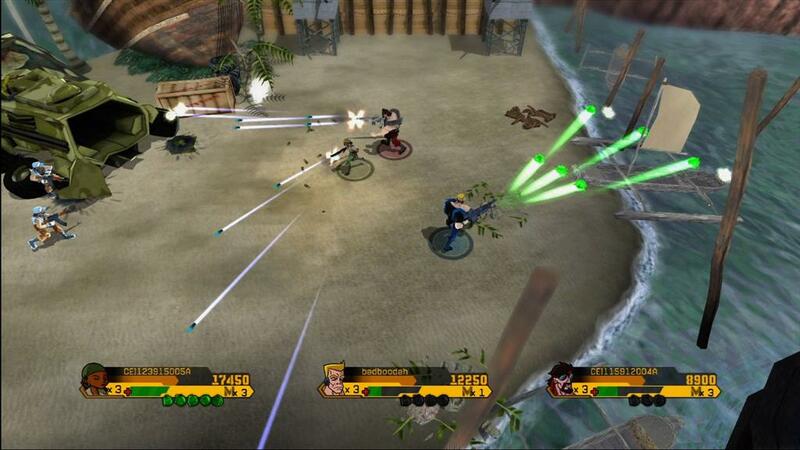 As an action game this is a solid shooter, even if it's nothing more than that. I had a great time from beginning to end, and then an even better time when I brought a couple of friends into the experience. There are a few minor problems I think are worth pointing out, though. For example, it's a shame there isn't more variety in the level bosses. There are also a few framerate hiccups, especially when there are a lot of people on the screen. 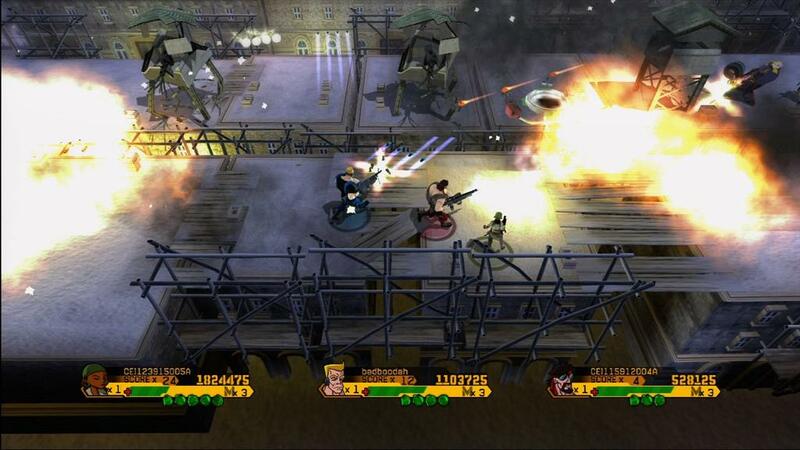 It also would have been nice if Capcom could have included the original Commando and MERCS, especially since there is so much time that separates these three games. I also hate it when companies hand out "6" and "7" point achievements, but that's a pet peeve I have to get over. None of these complaints will ruin the game, but they should be looked at before Capcom decides to release another game in this franchise. On a side note, buying Wolf of the Battlefield: Commando 3 will allow you to take part in the exclusive beta for Capcom's upcoming Super Street Fighter II Turbo HD Remix. Xbox 360 owners will no doubt recognize this kind of marketing strategy, as Microsoft already attempted something similar when they released the Halo 3 beta with their open-world action game, Crackdown. Whatever you do, don't buy Commando 3only for the Street Fighter II beta, the limited amount of content it will provide is certainly not worth the $10 asking price. 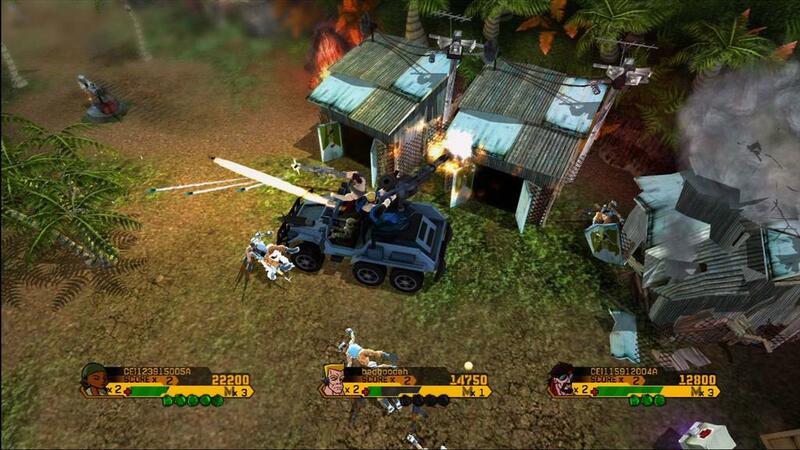 Buy Commando 3 because it's a solid action game that harkens back to a simpler era. 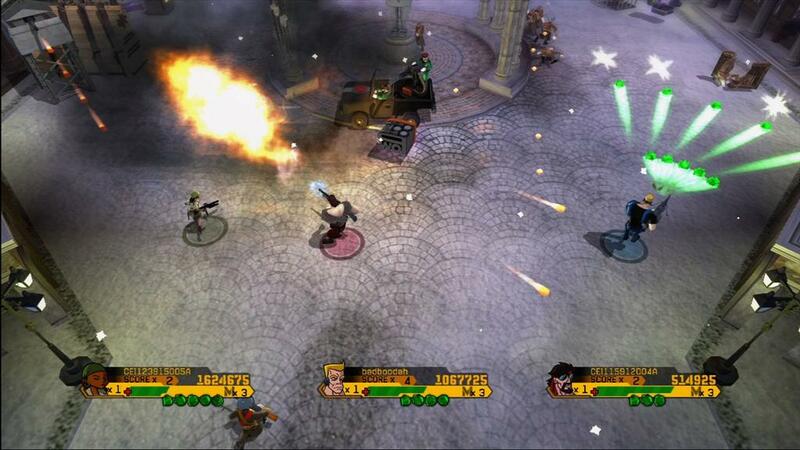 Buy this game because it's an incredibly fun multiplayer action game. Buy Commando for its own merits, not because you might get to play Street Fighter II a few months early. 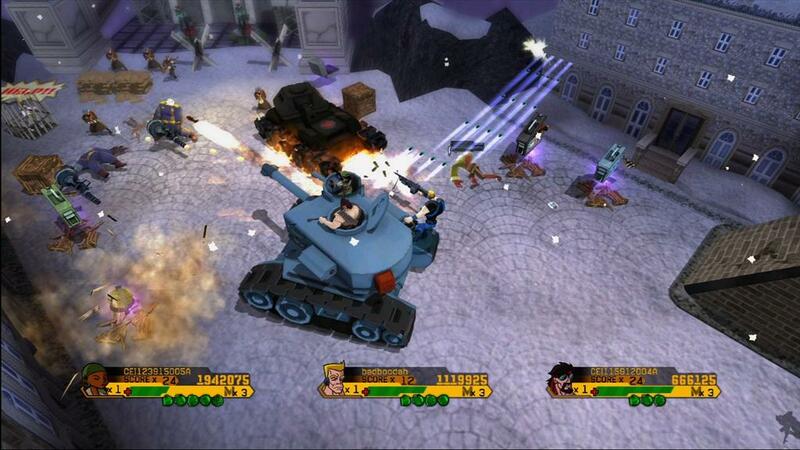 Wolf of the Battlefield: Commando 3 is a great game on its own merits. 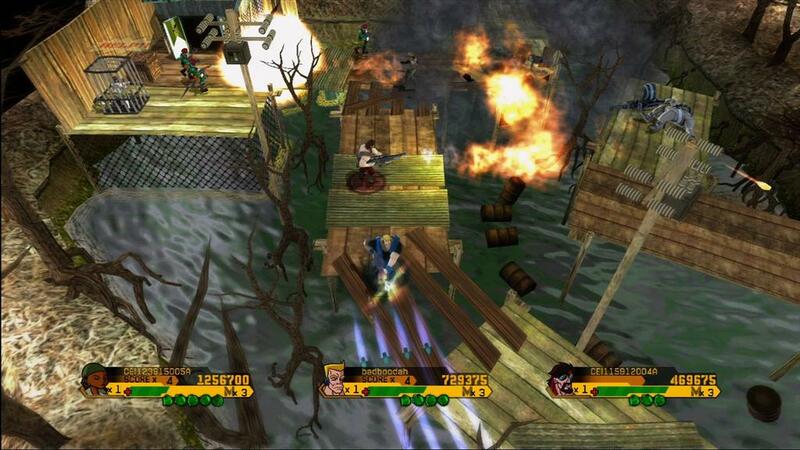 I can only hope that it's not another 18 years before we see Capcom release Commando 4. Despite its short campaign and repetitive nature, Wolf of the Battlefield: Commando 3 proves to be an exciting action game for one to three players. It's not quite as good as the two games that came before it, but that shouldn't keep you from having a fantastic time battling warlords and killing evil soldiers!